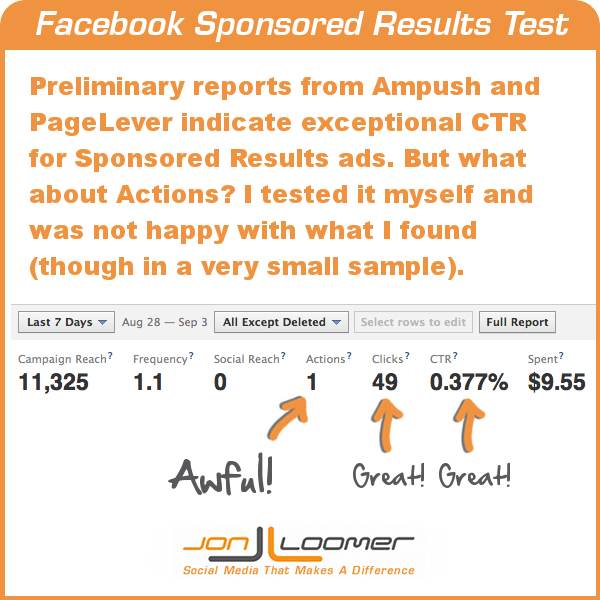 Facebook Sponsored Results: More Click than Action? Now that you can create Sponsored Results that appear in the Facebook search typehead, the overwhelming question is this: So, do the ads work? According to early results reported by InsideFacebook, the clickthrough rate is spectacular. Ampush Social is seeing CTR between .5% and 1% while PageLever is reporting between .8% and 2%. These rates are higher than that of standard Facebook advertising by a factor of 10 (or more). Note that some of these are well-followed Pages and some are not. In some cases, I wanted to reach people who were searching for a topic, but there was a Page under the same name. Other than the targeting mentioned, I cast a wide net. I didn’t care about interests because I figured that if they were searching for these Pages, they were within my target audience. This ad drove people to the landing tab for my Facebook marketing eBook. In order to access the eBook, they’d first need to Like my Page. Ad #2: Same as Ad #1, but targeting only users in the US. Ad #3: I targeted the same Pages and countries as in Ad #1, but this time I drove users directly to my Facebook Page. No carrot this time, just looking to get people to Like my Page. Ad #4: Same as Ad #3, but targeted inside the US. First, let’s focus on the Clickthrough numbers, since that’s the only data we’ve seen from preliminary reports. As you can see here, my numbers are consistent with what others have found. That said, my Clickthrough is far better outside of the US than inside, which is no surprise. However, I found it odd that so many more of my impressions were inside the US than outside. Also, there was no noticeable difference between my two ad variations. But the flaw with the other reports is that they don’t go beyond the click. We know there are Facebook bots out there. We know they are click happy. Do these ads inspire action beyond the click? For me, the answer is a resounding “No.” I won’t even show you the stats. I’ll just tell you that of the 49 clicks I received, only one resulted in an Action (a Page Like). Since all four ads were looking for the Like, I’d consider spending $9.55 for one Like (and no eBook downloads) a massive failure. Admittedly, the sample size of my test is as small as it gets. But the CTR is consistent with prior reports. It’s just not clear if my other results are also consistent. 1) Are brands seeing that these ads are not driving Actions? It’s possible that I am the exception here. But if brands are seeing a high Clickthrough rate and very few Actions, why? Is it a flaw with the ad unit? Is it because many of the clicks aren’t from humans? Is it because we as advertisers haven’t yet figured out how best to follow through on what we promise? 2) Are the other incredible results focused outside of the US? We need to train ourselves to start asking this question when we see Facebook ad results that are too good to be true. There is a high concentration of bots and spam accounts outside of the US. If you want to focus on specific countries, you can get some eye-popping — though hollow — numbers. 3) Are these ads prone to bot clicks? Yes, this is related to #2, but I’m curious about this. I realize that bot activity may be more sophisticated than I understand, but I had expected that this ad would be less prone to bot clicks due to the fact that users would first need to type a specific Page name into search. Granted, bot programmers would eventually work that into the code, but my expectation is that clicks on these ads would be somewhat clean out of the gate. My theory is that bots will inflate clicks and they’ll inflate Likes if there is a Like link within ads. But these ads are different because there is no such link. Users are redirected and then must perform the action. That’s why my suspicion is that these click numbers are inflated by bots, and those bots drop off after that first click. Am I wrong about this? Are these ads as susceptible to bot clicks? Maybe even more so? 4) Are my results an indication of a missed opportunity? When I see 49 Clicks ad only one Action, I can’t help but wonder if I did something wrong. It’s certainly encouraging that the ads at least got clicks. If not, I’d be more willing to point my finger at the ad platform itself. But since it got clicks and only one Action, I wonder if the problem is me. With only four different ads and two variations, I should split test more. There may be another angle that I need to take that would lead to success. It’s far too early for me to indict Sponsored Results in general. I need to collect more data. Have you tested Sponsored Results yet? Are you seeing similar CTR data? How about Actions?